Adidas miCoach Smart Run uses optical technology to track heart rate from wrist, an in-built accelerometer counting every step to help monitor stride rate and GPS to track speed, distance and logs. 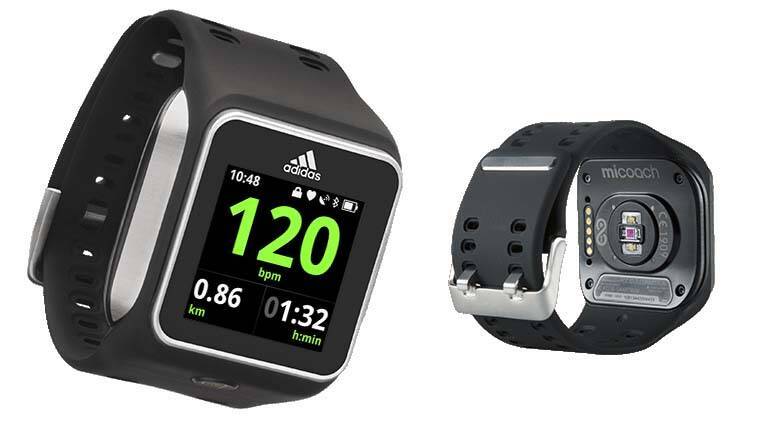 German sportswear major Adidas has joined the smartwatch bandwagon with its ‘miCoach Smart Run’, priced at Rs 24,999, which will allow users to monitor heart rate and play music. The smartwatch, which will be available exclusively on Adidas website, will also allow runners to track their runs using GPS mapping. “There are no cables, straps and additional sensors with this all-in-one device — Smart Run uses optical technology to track heart rate from wrist, an in-built accelerometer counting every step to help monitor stride rate and GPS to track speed, distance and logs,” it said in a statement. The device which would have 1.45-inch color touch screen display and features a MP3 player with Bluetooth support. It also provides audible coaching guidance. Adidas already offers a miCoach app on smartphones. Smart wearables, as a category, is growing globally with the likes of Samsung, Motorola and Apple coming out with their smartphones across various price points. While smartwatches from these firms are not dedicated to healthcare or athletics, most of these support apps like pedometer and heart rate monitor to help users monitor various bodily functions.